Recently my sister-in-law and her husband both celebrated milestone birthdays just before they jetted off for a 6 week holiday in the USA. My SIL suggested that the family put some money towards some special holiday experiences as a gift (and it was our job to suggest what those experiences might be). So my other SIL and I came up with a few suggestions of things to do with some US dollars (eg visiting Alcatraz and the Statue of Liberty) and while my other SIL organised the US dollars, I was in charge of making a card for the birthday boy and girl. As well a as birthday card for each of them, I decided to make a little passport for each of them with pockets in each page where I could slip in each US dollar bill and then on the outside of the pocket show the "Condition of Visa" which was our holiday activity suggestion. 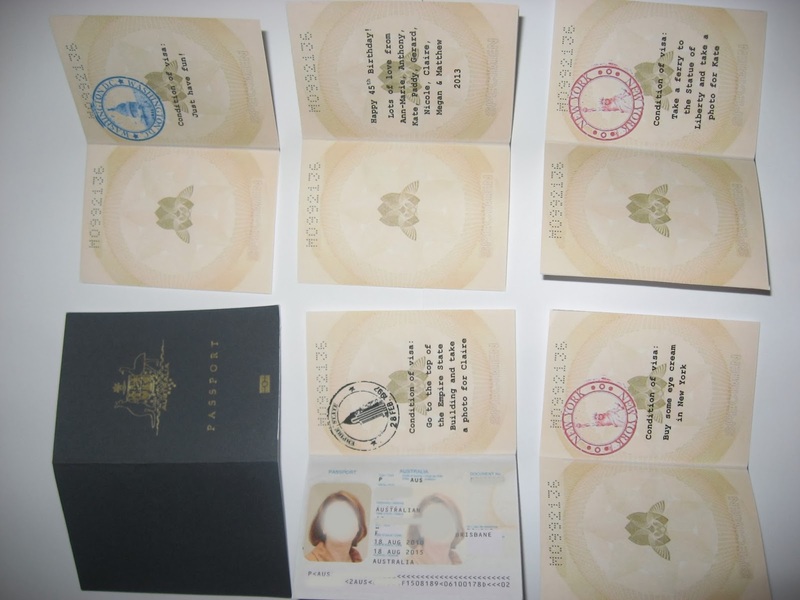 I found a photo of the cover of an Aussie passport on Google and then I also found a picture of the inner page of the passport which shows all the person's details. 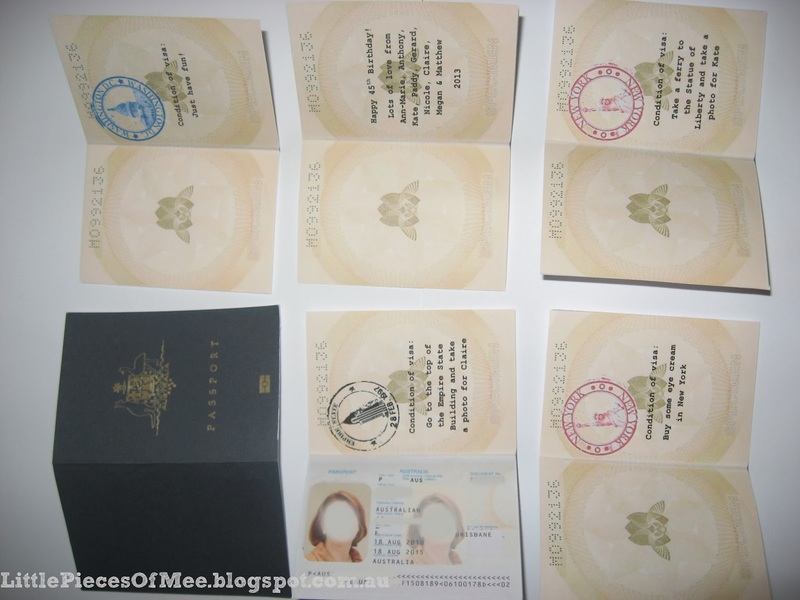 If I had access to the real passports I would have just taken a photo of them but I was short on time so I decided just to modify the Google image with a photo and text. For the text, Google told me that OCR was the font used in passports so I downloaded a copy of the font and played around with the text in Word to get the right size and spacing. 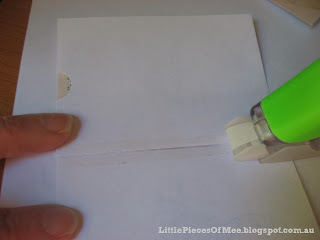 For the other pages, I found some passport-type stamps (also on Google - love that website!) to use for each city that we had an activity for. I used Courier New for the font on those pages. The finished passport (when closed) measured about 6.2cm (2 1/2 inches) wide and about 8.5cm (3 3/8 inches) high. I think the small size really gave it a unique look and it was just the right size for a folded dollar note. I was so happy with how the passports turned out - and I think my SIL and BIL loved them too! These are the pages just after I had printed and trimmed them to size. I used white cardstock for the cover and normal A4 paper for the inner pages. When I did a test run of the pocket for the inner page, I found that using the full width of the glue runner didn't leave enough room inside the pocket for the folded dollar bills. I hate wasting things so I put two pages side-by-side and glued both in one go so each page had only half the width of glue on it. You can also see in the photo above that I used a 1 inch circle punch to make a semi-circle at the top of the left hand side of the page - I did this on each left page to give a tab to easily get the money in and out of each pocket. This is how the pages looked once they were glued together (before I attached the cover). If you make your own version of this passport, I would love to see what you have made - leave me a comment and I will get back to you.